For the most part, in SW Florida, there are three ways to “clean” an Oriental, Persian, Turkish, wool or silk area rug. The method you choose will determine if your rug survives the “cleaning” as well as the thoroughness and result of the effort. Hand-Washing – Just as you would hand wash fine cashmere and silk sweaters, cherished area rugs deserve the love and attention that can only be afforded at the hands of an experienced rug cleaning professional. Hand washing allows corrective action during every step of the cleaning process while minimizing stress to your textile and guaranteeing a thoroughly exhaustive cleaning result. Steam Cleaning by your local steam cleaner – This is a BIG NO-NO! An area rug cannot be cleaned thoroughly in a home, PERIOD! Steam from commercial carpet cleaning machines can cause dye migration and pile distortion, and often, this damage is irreversible. Also, carpet cleaning technicians are NOT rug cleaning professionals. They are experienced in nylon wall to wall carpeting, not experts in natural fibers. Tub Washing (also called batch washing) – Some rug “cleaning” companies use impersonal, large wash tubs to wash many rugs at a time. They scoop up some area rugs, place them in a container filled with chemicals, and push the start button. All rugs are washed the same, regardless of construction or value. Imagine having your cherished Tabriz area rug washed in the same tub with a rug filled with pet urine. Many rug cleaning plants use batch washing equipment because it allows them to “clean” many rugs at the same time and after all, time is money. Oriental Rug Salon washes rugs by hand one at a time. Area rugs are cleaned in a bath of cold water using the appropriate cleaning solutions determined at the time of inspection. For us, the initial inspection process is the most critical step we can take to ensure the safety and cleanliness of each rug assigned for cleaning. The inspection process allows us to determine a “best method” approach. Sometimes, issues we discover during pre-inspection will dramatically alter our cleaning methods. We want to provide your rugs with the best possible care. That is why we take the time to thoroughly pre-inspect every rug that comes through the door. Spills, Pet Stains, and Spots with Color Issues – Knowing the structure of each spot will determine the specific cleaning combination to use in an effort to remove the stain while preserving the beauty of the area rug. We use Xenon lighting to uncover hidden pockets of pet urine, biological and bacteria matter and can take corrective action to protect the area rug. Pre-existing damage such as cuts, holes, tears or rips – We document our findings by photographing the area of concern and forward these images, along with a full inspection report to our client before the cleaning process. The client must acknowledge our findings before the area rug is introduced to the bath process. Hidden issues such as shoddy construction, dye lot variations, white knots, tea wash finishes and previous color correction. During the inspection, we may find hidden “dangers” that the client may not be aware of such as previous color corrections performed during the construction of the rug or at the place of sale. Also, when area rugs are dirty, the client may not be aware of white knots or areas of abrash, so we like to point these out ahead of cleaning. Dye migration – Evidence of previous dye migration caused by certain spills, pet urine, water intrusion or improper spotting techniques are noted in the inspection report. Even though we can correct a host of dye migration issues, some are permanent and the client needs to be made aware of them. Each area rug we receive for cleaning goes through a 24-hour bleed test so that the stability of the dyes can be determined. Traffic Lanes, thin pile, and distortion – During the inspection process, we use a high-intensity light to better identify areas of the pile that may be distorted. Often, area rugs showing distortion are because either the rug was not protected with an area pad or the textile is not being rotated every 3-6 months. We also check for dry rot. Insect issues – We check each area rug for evidence of moth or other insect activity, and with the client’s permission, we can proceed with processes designed to eliminate and protect the rug from further insect abuse. Oriental Rug Salon is a full-service Oriental, Turkish, Persian, wool and silk area rug cleaning and repair facility serving all of SW Florida and clients from around the United States. We are a Certified Partner with the prestigious Institute of Inspection, Cleaning and Restoration Certification (IICRC) and the International Carpet & Rug Institute (CRI). In addition, we are A+ rated with the Better Business Bureau and a five-year-in-a-row-winner of the coveted Angie’s List Super Service Award. Depending on the size of a hand-knotted area rug, a weaver spent months or years crafting that one single textile. This individual spent hours each day, sometimes in unbearable heat and cold so that they could earn money for their family. 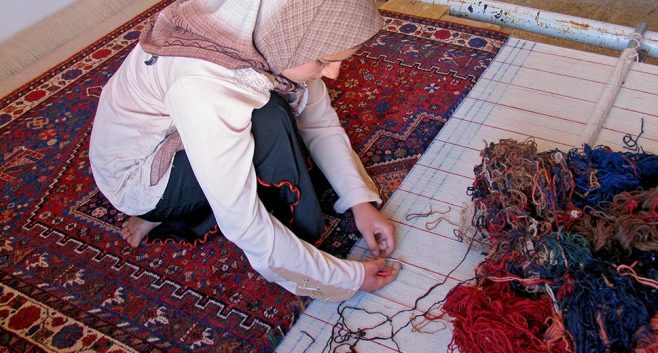 A lot of love and skill goes into the making of a hand-knotted area rug. Doesn’t your area rug deserve individualized attention during the cleaning and repair process? If Oriental Rug Salon can ever be of service, please do not hesitate to visit us online at www.OrientalRugSalon.com or call us anytime at 239-424-8171 – Lee and Collier County or 941-893-1655 – Punta Gorda, Port Charlotte, and Sarasota Florida. Oriental Rug Salon offers genuine hand washing of Oriental, Persian, Wool and Silk Area Rugs, Fringe Repair, Oriental Rug Repairs, Pet Urine Treatments for Oriental Rugs, Insect control, and area rug valuations. Oriental, Turkish, Persian, Wool and Silk Area Rug Cleaning Cape Coral, Naples, Fort Myers, Bonita Springs, Estero, Sanibel, Captiva, Useppa, Lehigh Acres, North Fort Myers, Fort Myers Beach, Marco, Alva, Punta Gorda, Port Charlotte, Sarasota, Buckingham, Saint James City, Matlacha and Bokeelia Florida.